MA-COM branded LD-66 pulsed laser diode, new old stock with minor shelf wear.This is a very powerful 904nm infrared laser diode mounted in a gold TO-18 carrier. This diode is designed for pulsed operation, and consumes approximately 12 amps at 1.2 volts when powered on. Note: these laser diodes are extremely dangerous, and produce invisible laser radiation with enough power to cause instant blindness. The light produced by this laser diode can not be safely viewed without proper eye protection. More.... . . . . . . . . . . . . . . . . . . . . . . . . . . . . . . . . . . . . . . . . . . . . . . . . . . . . . . . . . . . . . . . . . . . . . . . . . . . . . . . . . . . . . . . . . . . . . . . . . . . . . . . . . . . . . . . . . . . . . . . . . . . . . . . . . . . . . . . . . . . .
Small NPN transistor of unknown specification, mounted in a white ceramic carrier with gold leads and black ceramic cap. The manufacturer of this device is unknown. Three amp germanium power transistor, new old stock. The 2N1756 is housed in an unusual pill-shaped package with chassis mounting holes and a elliptical metal cap. This is the special socket that is designed to mate with many early collectible transistors, including the 2N21, 2N27, 2N39, and 2N110. A hard-to-find part that is very useful when building projects with these early transistors. 1N1084 cartridge diode, new old stock with minor shelf wear. 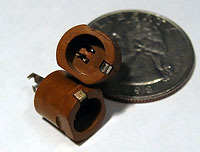 This rather hard to find part is used in various Collins receivers and is designed to be plugged into a fuse-style holder. 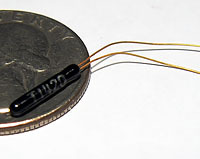 A cartridge style point contact diode. Alternate part number variant of 1N23. Ceramic body with gold cap and base. Unlike some early point contact transistors, no opening has been provided for adjustment of the point contact. Phenolic socket for use with the extremely rare Raytheon CK703 and CK716 cartridge type point contact transistors. Sockets for these transistors are difficult to find and are a virtual necessity for building circuits with either device. Units are new old stock with minor shelf wear. A rare socket for Western Electric 'type A' cartridge transistors like the 2A and 2N22. Sockets are new old stock with minor shelf wear. These sockets will also work with transistors made by other companies that have a 'type A' package, but will not work with the Raytheon cartridge types like the CK716. The 1N2175 is a silicon photodiode that is manufactured by Texas Instruments. Also known as a 1S701, the 1N2175 is packaged in an unusual cylindrical glass capsule with hair-fine gold leads. These diodes are new, and still packaged in their original envelopes. 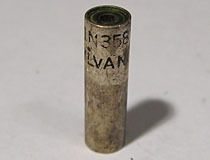 Hard to find Sylvania 1N358 cartridge diode, used condition. 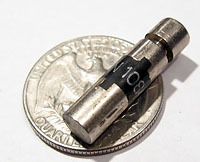 The 1N358 is an obscure tripolar RF frequency diode in a coaxial package. This coaxial package was designed to be inserted into a complex socket which would leave the business end of the diode poking into a hollow waveguide. This is a fairly early semiconductor part, and was first released in 1955. 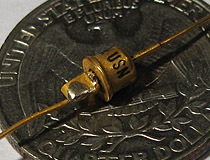 USN 1N696 diode, new old stock with minor shelf wear. 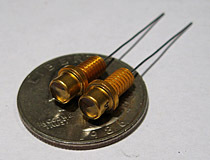 This small diode is encapsulated in a gold metal can package with flying leads bonded to each end. Unfortunately we do not know the specifications of this device, but it likely dates from the 1960's given it's part number and construction style. We have no idea what these are, other than that they are microwave frequency diodes and were probably very expensive new. Device has a gold and white package with gold surface mount leads, and was packaged in a foam lined antistatic container. 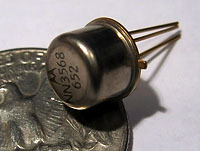 The NN3568 is a TO-5 package transistor of unknown specification. This transistor has gold leads and a gold base, new old stock. Manufactured by Motorola. International Rectifier 6400005 mystery diode, unknown specification, new old stock. These are designed to be welded or soldered to a threaded stud for mounting.